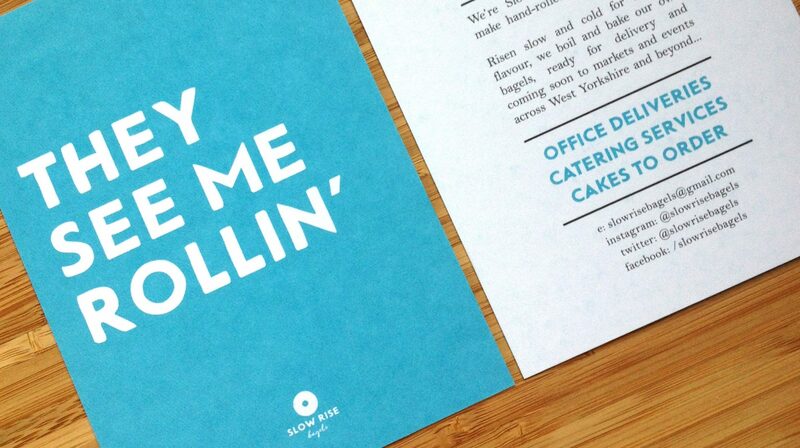 …To the home of Yorkshire’s finest homemade bagels. We make, roll, boil and bake our own bagels fresh out of our Agbrigg kitchen in Wakefield, ready to be stuffed and wrapped and brought to your belly via offices and food markets. We also do a range of cakes and other baked treats, with an emphasis on European baked specialities including pretzels, rugelach, swedish chocolate cake and pastel de natas. We’ll be adding more information about our bagels and our other creations soon – in the meantime, don’t forget to say hi if you’re stopping by. We’ve been making bagels since 2014, when we happened upon assisting the formidable Fine Bagels whilst living out in Berlin. After packing up and heading back to glorious Yorkshire in 2015, we started up Slow Rise Bagels, bringing authentic, hand-made bagels to the area. We believe that good things take time and should never ever be rushed. Slow Rise is the way our bagels are made – risen cold and over a long period of time so that they have a full flavour and a characteristic chew to them. But Slow Rise is also our way of doing things. We are an independent business that believes in building sustainably and never compromising for the sake of a few saved minutes. We’ve spent the last few years sourcing the best ingredients and perfecting our batches to make what we think are the very best bagels you’ll find in Leeds, Wakefield and around West Yorkshire. Whether they are filled for your lunch or ready to pop in your toaster at home, we hope you enjoy them. We deliver filled bagels and a selection of baked goods and extras to a range of offices and small businesses in the Leeds and Wakefield areas. Our delivery days are currently Wednesdays, Thursdays and Fridays and we’re also able to do platters for larger meetings. More information is coming soon! We’re regulars at the Kirkstall Deli Market in Leeds, which is held on the last weekend of every month. Get a hot filled bagel to go, or take a few for your toaster. Over the next few months, you’ll also see us at a range of pop ups across West Yorkshire. Check the upcoming events for more details of where we are next. If you’d like us to stop by your place, are looking for bagels for your cafe or think we can work together for a particular event, contact us for more information. We’re always looking for new people and places to share our bagels with. To get in touch with us, pop into our Agbrigg kitchen to say hi, or if you’re short on time, use the form below.